How are you? Hope all is well. 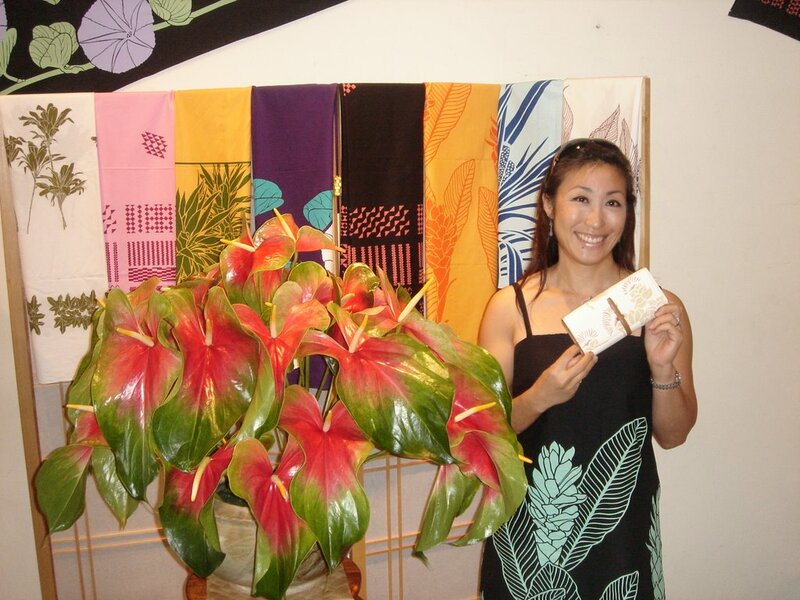 Just wanted to let you all know that the Hilo Sig Zane Designs Store will be closed Thursday June 29th because we're all going to be studying about native plants with Nalani at the foot of Mauna Loa! Very Exciting, and be sure to tune in the next day for a full report! 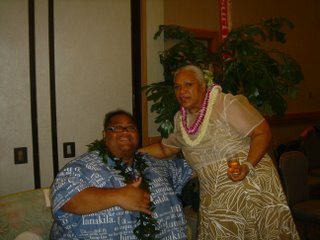 PS By the way, the dress that I'm wearing is called the Ho`onani Dress in the Monstera print... it's in the stores now! Here's a photo of me and my BOSS (not Hugo), Sig! 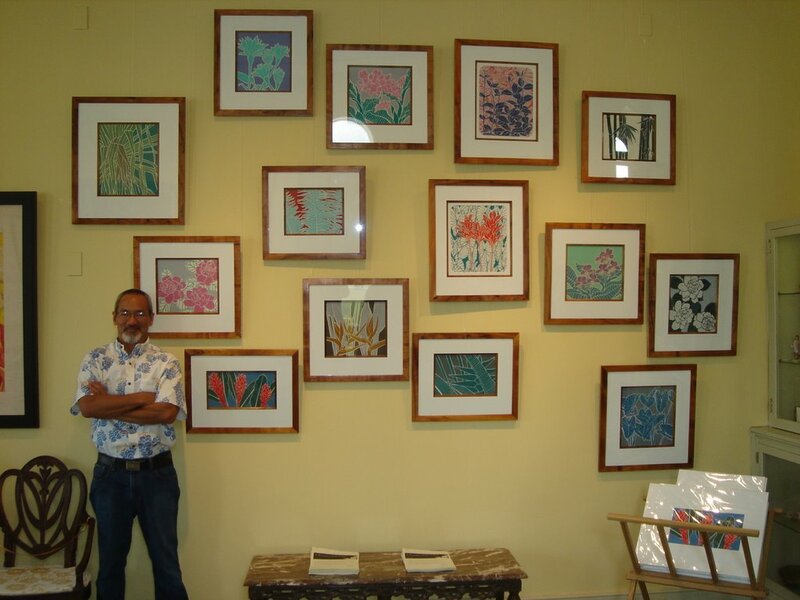 He's wearing our 20th Anniversary print design shirt in Keahihanakahi print, which depicts the flower of the Big Island, lehua. Today, I decided to wear the Opuao linen blouse that I introduced to you all yesterday, in white, with the Noeulakapalai print. Hope you all like the white version! Hot New `Opuao Linen Blouses are Here! We have news to get you off on a great start this week! Come try it on and see what I mean! 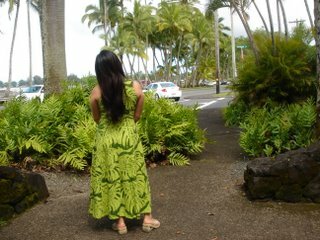 Aloha from Sunny and Beautiful Hilo! 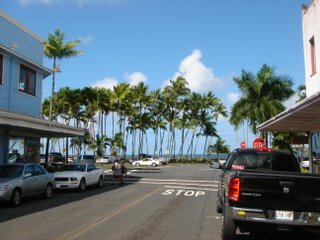 Just wanted to share with you this beautiful day we had in Hilo! The palm trees, azure sky, white clouds, plenty of sunshine, the ocean breeze, and blue ocean... It sure was a "Lucky we live in Hilo!" kinda day! Just wanted to let you know that there are lots of new items in the store. Our website also has all the items that are shown in this photo as well, so if you haven't seen them, please come check it out! PS Thanks Edgar, for taking the photo! 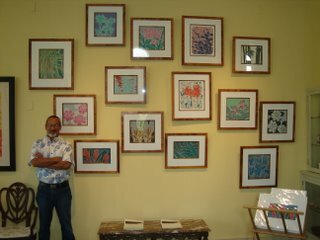 It was this February that Sig's T-Shirt Art Collection made a debut at Parker Ranch Historic Homes during the 2006 Waimea Cherry Blossom Festival (see photo). And now, the exhibition is going to travel to Tokyo, Japan! From July 1st through 20th, you can go to I-Stylers in Minami Aoyama (in the chic district of Tokyo) and you will be able to encounter some of the beautiful original art works by Sig Zane! Hope you enjoy Sig's art! Nalani in Amami and Hayama! What are you doing in July? 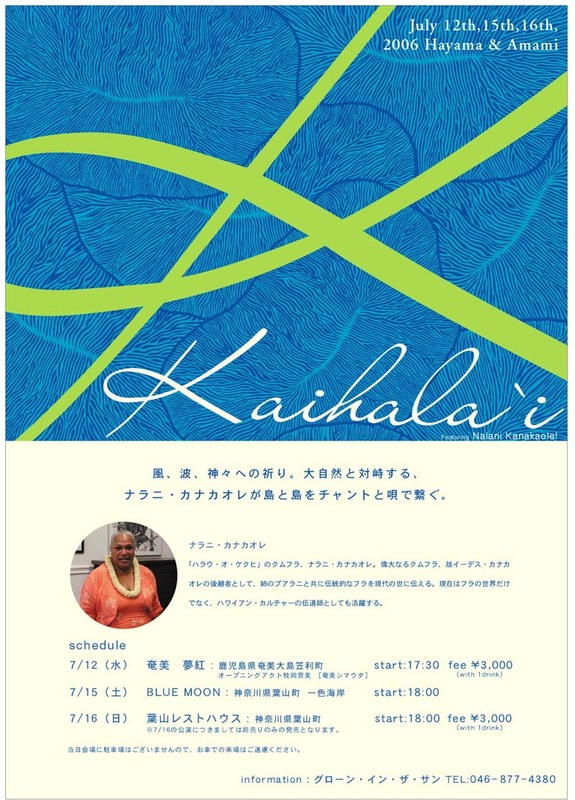 Come to Amami Oshima (group of islands right above Okinawa) or Hayama (right near Kamakura, Japan) to see Nalani sing! 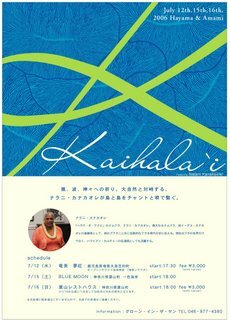 She will be singing along with gentle ocean breeze on July 12 (Yume Kurenai in Amami) and July 15 (Blue Moon in Hayama). Hope to see you there at the beach! Gone Fishin' on Father's Day! Well, it was a fishing kinda day here in Hilo on Father's Day! 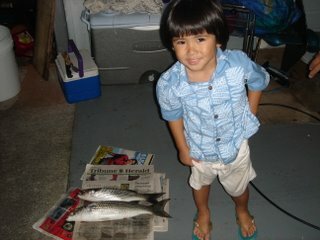 Luke "caught" 2 mullets! Good going! Sig sent me this photo of the two (yes, it's Konishiki, the former star Sumo wrestler and Nalani, Sig's wife and kumu of Halau o Kekuhi) at the party for the Pan-Pacific Festival which took place over the last weekend! They had a Grand Time as you can tell from this photo! Summer is Here with Hoike Dress! Summer is here indeed! The beautiful blue sky days are here in Hilo, and this is the perfect dress to get into when it's sunny out there. 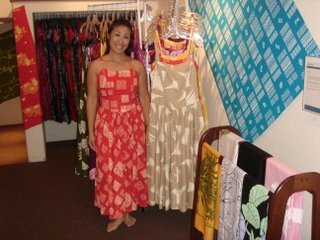 So get down to the Sig Zane Designs stores (either in Hilo or in Maui) and grab your favorite color! See you at the party! Sig wins the Asian Entrepreneur of the Year Awards 2006!! Sig Zane was awarded the prestigious Asian Entrepreneur of the Year Award 2006 this past May 27th! This is a national level award where the Asian American business people are recognized for their excellence. This is especially nice since we are celebrating our 20th year anniversary in business. 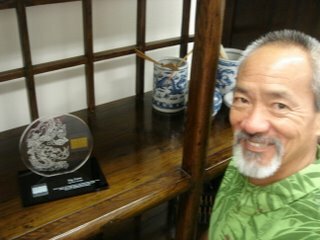 Mahalo to all of you who have supported him for all these years! We were there for the first Moku O Keawe International Festival in Miyazaki and we had a blast. 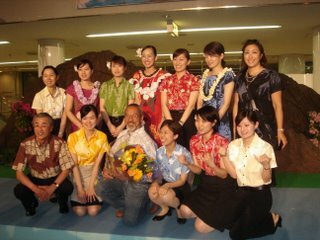 Mahalo to all of you in Miyazaki and to all the Miyazaki Airport Building Staff who are now wearing Sig Zane Designs shirts and blouses. You all look great!! !